Offering you a complete choice of products which include cement block machine, chirag automatic cement block making machine, chirag fully automatic cement block making machine, chirag semi automatic cement block machines, chirag multifunction cement block machines and chirag multi material cement block machines. We hold expertise in offering an exclusive range of Cement Block Machine to our clients, which is made using best grade raw materials and advanced technology. These are highly demanded for its special features optimum performance and corrosion resistance make it highly demand able in the global arena. We meet the bulk demand of clients within a committed time frame.Introduction:Chirag CI3-20 is a new type of semiautomatic block machine that is specifically design for small and medium-size enterprises. Hydraulic control, manual operation, automatic feed materials and pallets. Using compulsion feeding device to feed the materials quickly and smoothly.. Specifically design for making pavers. The surface material can be feeded automatically. Good quality framed structure, easy to use, repair or clean. 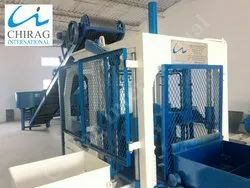 Chirag Automatic Cement Block Making Machine Target User: requires high production output of concrete blocks, in different types, sizes, shapes and colours. Chirag Automatic Cement Block Making Machine Applied Products: concrete blocks, solid/hollow/cellular masonry products, paving stones with or without face mix, garden and landscaping products, slabs, edges, curb stones, grass blocks, slope blocks, interlocks etc Chirag Automatic Cement Block Making Machine Applied Fields: widely used in buildings, road paving, squares, gardens, landscaping, city constructions, etc Chirag Automatic Cement Block Making Machine Raw Materials: crushed stone, sand, cement, lime, flyash, cinder, slag, gangue, gravel, perlite, and other industrial wastes. 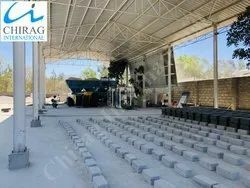 Chirag Fully Automatic Cement Block Making Machine Target User: requires high production output of concrete blocks, in different types, sizes, shapes and colours.Chirag Fully Automatic Cement Block Making Machine Applied Products: concrete blocks, solid/hollow/cellular masonry products, paving stones with or without face mix, garden and landscaping products, slabs, edges, curb stones, grass blocks, slope blocks, interlocks etcChirag Fully Automatic Cement Block Making Machine Applied Fields: widely used in buildings, road paving, squares, gardens, landscaping, city constructions, etcChirag Fully Automatic Cement Block Making Machine Raw Materials: crushed stone, sand, cement, lime, flyash, cinder, slag, gangue, gravel, perlite, and other industrial wastes. Chirag Semi Automatic Cement Block Machines Target User: requires high production output of concrete blocks, in different types, sizes, shapes and colours.Chirag Semi Automatic Cement Block Machines Applied Products: concrete blocks, solid/hollow/cellular masonry products, paving stones with or without face mix, garden and landscaping products, slabs, edges, curb stones, grass blocks, slope blocks, interlocks etcChirag Semi Automatic Cement Block Machines Applied Fields: widely used in buildings, road paving, squares, gardens, landscaping, city constructions, etcChirag Semi Automatic Cement Block Machines Raw Materials: crushed stone, sand, cement, lime, flyash, cinder, slag, gangue, gravel, perlite, and other industrial wastes. Chirag Multifunction Cement Block Machines Target User: requires high production output of concrete blocks, in different types, sizes, shapes and colours. Chirag Multifunction Cement Block Machines Raw Materials: crushed stone, sand, cement, lime, flyash, cinder, slag, gangue, gravel, perlite, and other industrial wastes. Chirag Multi Material Cement Block Machines Target User: requires high production output of concrete blocks, in different types, sizes, shapes and colours. Chirag Multi Material Cement Block Machines Applied Products: concrete blocks, solid/hollow/cellular masonry products, paving stones with or without face mix, garden and landscaping products, slabs, edges, curb stones, grass blocks, slope blocks, interlocks etc Chirag Multi Material Cement Block Machines Applied Fields: widely used in buildings, road paving, squares, gardens, landscaping, city constructions, etc Chirag Multi Material Cement Block Machines Raw Materials: crushed stone, sand, cement, lime, flyash, cinder, slag, gangue, gravel, perlite, and other industrial wastes. Chirag All In One Cement Block Making Machine The whole process uses a PLC aptitude control and dialogue system of human-machine interface, easy to analyze the chance signal, ensure the best operation effect. Chirag All In One Cement Block Making Machine The cloth system adopts semi-closed screen reticular rotational feeding unit to feed materials forcedly, with evenness and even speed, ensuring product intensity. Chirag Modern Block Machines for our esteemed clients. These machines are designed and developed in compliance with the industry standards. Chirag Modern Block Machines Provided in varied models & designs, Fly Ash Brick Machines are also offered to clients at economical prices. Looking for “Automatic Cement Block Making Machine”?